Day 10, our flight back to Singapore is in the afternoon.The good thing is this will provide us with at least nearly half a day more in Seoul to do some final shopping. We will check out our hotel and leave our bags again at the security deposit. We will then decide where to go based on any last minute buys intended. After lunch, we will return to our hotel to pick up our bags. We will go to the COEX City Air Terminal from the direction of exit 2, Samseong Station to get on the City Aiport Limousine Deluxe Bus which will take about 1hr 30mins to 2hrs to get to Incheon International Airport. Bus ticket is 14000W per person and sold on the 2nd floor of the COEX City Air Terminal. First bus to airport is 5.20am and last bus to airport is 8.00pm. Interval between services is 5 to 15 minutes and the bus will bring you directly to the 1st floor entrance to Incheon International Airport. 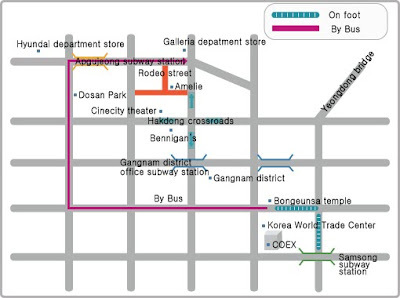 More information on this bus service can be obtained from http://www.calt.co.kr/index.html?menu=intro&v=eng . Spending quality couple time is very important to us. It's just wonderful to find someone whom you can just find common things in life to enjoy together. Sometimes, we hear of couples who say that they spend the weekend apart, each doing their own things, the guy playing soccer with his buddies and the lady having high tea or shopping with her friends. While it is to each his/her own brand of happiness, we believe that the point of marriage is to do more things together and through the time together, find a common experience to bond and understand each other better. Many couples claim that they have been together for long periods like 10 years but when one really analyzes the quality of time spent, it was spent in silence watching movies, doing their own things and the couple only meet during 1 weekend every week for 10 years. The quality of time would not be comparable to a couple who met for 6 months but everyday of that 6 months, there was engaging conversation and quality time doing things together to discuss future plans and learning about each other. Sometimes there needs to be some form of stickiness to each other. Otherwise, what's the point of marriage if it's not going to change much from what one does during dating or if it is just to get a HDB flat or to have children before 30. (Above) Indulging in our fondness for cakes! 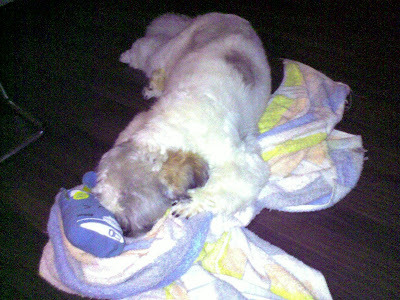 Our doggy - Shayna is 2 years or a teenager in human terms(14yrs). Celebrated her birthday with a food treat(below) for her since food is her no 1 priority. She is still hyper and more greedy than ever.The greedy girl never tires of eating. She's 7kg now already. (Below) She will lie down on our shoes at the shoe rack near the main door to wait for us if any one of us is out. She still likes to play with her poo! On our final day in Seoul, we will engage in a little cultural awareness by heading for the Namsangol Hanok Village is located in the Pil-dong area on the skirt of Namsan (Mt.). It is a mini folk village consisting of a number of traditional Korean-style houses. More specifically, there is a traditional garden with a pavilion, a pond and 5 traditional Hanok, including the home of Lady Yoon, the Queen Sunjeonghyo. 2~3 traditional wedding ceremonies take place here every week. Namsangol Hanok Village displays various household goods and furniture arranged in accordance with the times of which they were a part. Visitors can thus get a glimpse of the lifestyle of powerful literati in the Joseon period. We plan to reach there in time for the opening hours which start from 9am. 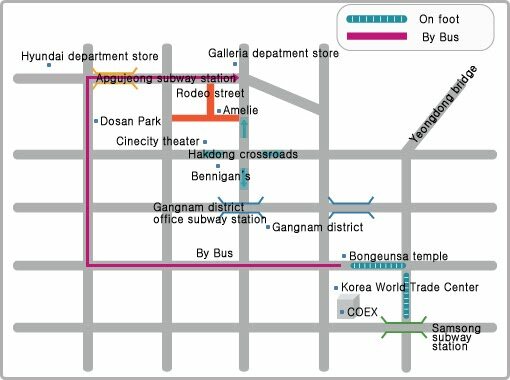 To get there from our hotel subway station at Samseong, we will alight at the fourth sstop which is Seoul University of Education Station and change to Line 3 and take the train along that line up to Chungmuro Station which is the ninth stop. There are the usual souvenir shops, traditional games booth such as 'neolttwigi' (sea-saw jumping), 'tuho'(arrow throwing) and 'yunnori' (traditional game of throwing wooden yut sticks). We may rent traditional hanbok costumes and take some photos. We will probably leave by 11 plus and head for Sinsa Station on Line 3 which is the 6th stop from Chungmuro Station. Looking for lunch, we could head out via exit 1 from Sinsa Station and walk to the second street on our right. At the first left of the second street, we will come across the aroma of fish being freshly grilled. This is Gui Daehak, a popular lunch stop for the locals that’s a well kept secret. It is supposedly super packed with locals around lunch time, Gui Daehak serves a mean grilled fish. Their Jaeyuk Bokkeum (spicy stir-fried pork) that is also recommended is hot and tangy. This is a no-frills place, so expect no room for your bag–and no room for dessert. If not, we will walk towards exit 8 of Sinsa Station. 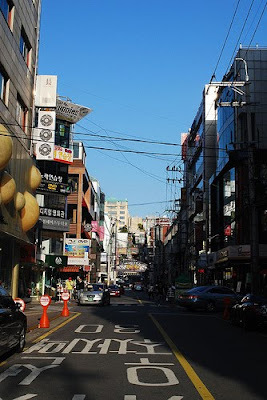 From there, we will walk about three blocks until we reach a corner with the area’s tallest building and then turn left onto our shopping destination - Garosugil Street. As the Korean name implies (Garosugil means “tree-lined street), this street is famous for the trees, which line both sides of the 700m-long promenade. In summer, the trees’ verdant green leaves provide welcome shade for shoppers, and in autumn these ginkgo trees turn golden. This sophisticated, up-and-coming street is flanked with all sorts of trendy shops and European-style cafes. You can stroll along shopping at your own leisurely pace and then relax on cafe terraces with coffee and a tasty desert. Garosugil Street in often been referred to as ‘Europe in Seoul’. From the pictures, it would not be too difficult to imagine oneself walking in a European street. There are many French and Italian cafes there that add to the European atmosphere. This street is famous for expensive food and drinks with coffee starting from 7000W or SGD$8.50. If one is looking for cheaper eats, there are eats such as Bucella for sandwiches and Oriental Spoon’s pan asian meals. Some shops that are popular there are - London Sole is a shoe boutique that specializes in ballet flats. The boutique started in London and also has a branch in LA, where its fans include Hollywood celebrities such as Sarah Jessica Parker and Katie Holmes. The Seoul branch at Garosugil, has also become a favourite of Korean celebrities Song Hye-Kyo, Lee Na-young, and Chae Rim. The store's candy pink-coloured exterior grabs your attention from afar, and its flat shoes have many original designs made from the highest quality. It is located on Garosugil Street opposite the opposite Bloom & Gouté café and is opened from 10.30 – 8pm. Another shop is EYE 11 which is run by a fashion designer, is well known for its unique and stylish clothes. At the store, shoppers can purchase various types of customized clothes such as T-shirts, dresses, and pants. It is located 10m away from London Sole and is opened from 9 am to 10.30pm but is closed on Sunday. Gayle will definitely be interested in Mogool, the ultimate hat store. This store has a wide selection of hats, it sells imported products as well as original designs by the owner and is worth visiting if one is looking for something unusual to complete an outfit. This shop is 20m away from Bool and Goute and is opened Mon to Sat from 11am to 9pm and 12pm to 6pm on Sundays. The next place we may stop by is Corso Como. This 3 storied store which is opened daily from 11am to 8pm is designed to make shoppers feel that a fashion magazine has come to life. Here, you can find luxury clothes by many designers, a bookstore, a music store, interior design products and a wine bar. Probably, we will just window shop since this is a place where celebrities like Park Yong-Ha, Kang Dong-Won and Seo In-Yeong shop. Who knows, we may just bump into them here. Along the way, we may stop by some of the café to have a drink and some pastries. One place is 5 CIjung which is both a café and a small art gallery where you can see work by amateur artists. The interior is painted white to best display the paintings, and the store is small and cozy. Soft persimmon yogurt (hongsi yogurt) and fresh ginseng milk (Susam milk) are the most popular items on the menu. Tea is served with a scone and decorations, which are so cute that you'll definitely want to take photos.It is located just off Garusogil street. Go into the alley next to Starbucks and walk straight. We will probably walk from Garosugil down to Cheongdam-dong and end up at Apgujeong where we will have our dinner there. One possible place would be Gaehwaok. This restaurant specializes in tasty bulgogi in an attractive atmosphere. Lightly spiced, and a high-grade beef, bulgogi is cooked on a Korean-style brazier for optimum temperature and taste. Also famous are bossam, consisting of sliced pork and kimchi, and ibuk-sundae, North Korean style sausage prepared by a cook, originally from North Korea. In addition, side dishes such as mildly sour radish kimchi and fresh vegetables will stimulate one’s taste buds. The restaurant interior resembles a gallery with art adorning the walls. This restaurant is opened 24hrs and meals start from 23000W for bulgogi to 3000W for bossam. To get to the restaurant, locate Mcdonald’s across from the Galleria Department Store. From McDonald’s, walk to the left of McDonald’s until you reach a T-intersection. Turn right and walk straight down about 40 meters until you see the restaurant sign. If you prefer walking to the restaurant from the Apgujeong Station, go out of Exit 2 of Apgujeong Station. Go backwards and proceed about 450 meters along the main street, until you reach an intersection. Cross the street and proceed past the S-OIL station about 450 meters, until you reach McDonald’s, which will be on your right. Another place to eat is Goshen which is famous for being the place where top Korea movie star Jung Woo-Sung was picked up while he was working as a waiter. The café's terrace is decorated with flowers and trees, so be sure to get a table outside if the weather is good.However, if all the seats on the terrace are taken, seats inside are also good since an entire wall of the café is made from glass, and so if you sit by the window, you will feel as if you are sitting outside. The café has a diverse menu, which includes western food such as salads and pastas, as well as Korean classics like tteokbokki (spicy rice-cake) and bokkeumbap (stir-fried rice). The tteokbokki is large enough for 3-4 people to share. During the day, the café has a casual atmosphere, but in the evening, when the candles are lit, it becomes quite romantic. The café is close to the Galleria Department Store. Enter the alley next to the Coach store (located opposite Galleria Department Store), and walk until you reach Goshen on your left hand side. After dinner, we forsee more walking and shopping. If we are tired and want to find a place to seat down and have a cocktail, we can go to Once In a Blue Moon, a jazz café opened from 5pm to 2am. This is one of the favorite filming locations for miniseries and movies. You may already have seen it in Lovers in Paris, Wolf, Green Rose, and Marrying the Mafia. It is also often used to film TV commercials. If one are in the mood for some jazz music, this night spot will offer some smooth, romantic jazz rhythms in an upscale ambience. This would be just the right soothing and relaxed place to end our stay in Seoul. To get there, use exit 2 of Apgujeong Station, and walk straight ahead and take the crosswalk. One will pass by S-Oil gas station and then continue to walk ahead. At the Galleria Department Store intersection, cross the street and turn right. This will be a 15-minute walk from the Apgujeong subway station. From Apgujeong Station, we could try for an early dinner to avoid the dinner crowds. From the entrance of exit 4 from the station, we can proceed between DUNKIN DONUTS and THE BODY SHOP until we reach an intersection. From the intersection, we will turn left and then turn right at a T- intersection. A further walk about 50 meters should bring us to a restaurant sign that looks like this, “開城 house.” Gaeseong House is next to BOSS CLUB. In this restaurant, an elderly woman from Gaeseong (in North Korea) serves up her native cuisine. The attractive interior of Gaeseong House attracts bboth young and older customers who love Gaeseong-style food. Favorites include joraeng-pyeonsu-guk, a rice-cake and dumpling soup cooked Gaeseong style. If one is there during lunchtime, the table d’hôte is recommended: you can enjoy various menu items such as bossam (boiled meat slices wrapped in lettuce leaves or kimchi), steamed pollack fish, Korean pancakes, mung-bean jelly, japchae (mixed noodles, vegetables, and beef slices) and cooked greens. Since we aren’t fluent in Korean, naturally, we will attempt to choose a dinner course ranging from 25000W per person to 50000W per person. This restaurant is opened daily from 10am to 10pm but is closed every second and fourth Sunday and public holidays. Apgujeong’s most fashionable landmark – the Galleria Departmental Store is opened daily from 8.30am – 10.30pm. The walk should take about 25 minutes or one can just hail a cab to reach the Galleria. It is divided into two separate buildings, the East Gate (명품관) and West Gate (생활관). Notable feature of the West Gate is the impressive architectural feature of 4330 glass discs mounted to the existing concrete structure that reflect mother-of-pearl during the day and light up at night. The luxurious interiors were designed to resemble a glossy catwalk, with wide, bright corridors flanked by beautiful shops, cosmetic counters and a huge variety of grooming products. The West Gate also boasts a large supermarket, wine shop and bakery located at basement level. Enormously popular, this should be a starting point for any new shoppers to the area. Though both buildings carry a wide range of high end products, the West Gate is the more affordable of the two. Here one can find a host of cosmetics (Chanel, Lancome, Estee Lauder), hair care products (Kiehl’s, Organics), facial moisturizers (Biotherm), and a long line of fashionable apparel (Lacoste, Addidas, Hugo Boss, Kenneth Cole) all under one roof. The super bright stylish interior was designed to make it easier for shoppers to navigate within a fresh, clean shopping venue. At the East Gate, there are fewer shops in this building but they are considerably larger and much more elaborate in design and products. Products sold here are perhaps the most expensive and exclusive in all of Apgujeong. The shopping experience here is a little more traditional in detail and may appeal more to middle-aged and elderly shoppers with slightly more conservative tastes. The building is also referred to as “The Galleria Luxury Hall”. After an hour plus at Galleria departmental store, we will cross the road in front of it and walk towards Mcdonalds. From Macdonalds, we will walk further down for 5 minutes before coming to a sign welcoming us to Rodeo Street. Along the way, we will take note of sidestreet stalls that we want to visit the next day. Rodeo Street has many cafes that make for great vantage points to watch the stream of stylish passerbys; celebrity sightings are not uncommon. For those who want to dine in and catch stars, be sure to check out the signs that hang outside the restaurants that indicate they have famous regulars. There are established brand shops here such as Jimmy Choo, Boon The Shop, Mango, Tommy Hilfiger and Guess. There are also dozens of tinier outlets that carry a limited number of particular brands such as Banana Republic, GAP, Abercrombie & Fitch, Club Monaco, American Outfitters and Old Navy, making purchases much more original and unique. There are also many cafes with beautiful interiors, and many Korean, Thai and Japanese restaurants. Beauty shops also cluster the streets there. 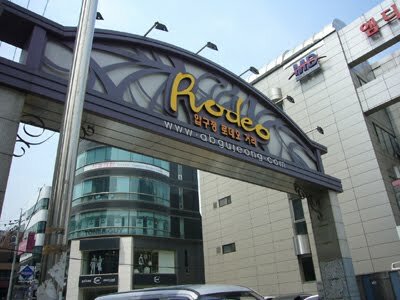 Recently, many movie companies have moved from Chungmuro to the vicinity of ‘Rodeo Street’, which is creating a new theater space as well. Along with the opening of Multi-Plex Cine-City, more theaters such as Cinehouse, Cineplus. and Nanta Theater (non-speaking performances) have moved into the area. Once we are fully satisfied, we will take the train back to our hotel from Apgujeong Station. From Apgujeong Station, we will drop off at the 4th stop at and make a transfer there to Line 2. We will then alight at the 4th stop on Line 2 from Seoul University of National Education Station which is Samseong Station and walk back to our hotel to rest our feet and pack up for tomorrow’s departure from Seoul back to Singapore. Our eighth day in Seoul, we plan to have some fun at South Korea’s version of Disneyland and Universal Studio – Lotte World which is opened daily from 9.30am to 11pm..
After breakfast at the hotel, we will head for our nearest subway station-Samcheong Station which is opposite our hotel. There we will take the subway line 2 and alight at the 3rd stopwhich is Jamsil Station. We will head for exit no4 which is directly connected to Lotte World via a underground shopping arcade. Lotte World can be reached via trains travelling on or transfer onto Line 2 and Line 8 if you are coming from other stations or subway lines. Lotte World is a theme park packed with interesting rides, an ice-skating rink, parades, a folk museum, a lake, and much more. About 6,000,000 tourists come here every year and it is open all year round, regardless of what weather is it as a large number of the attractions are indoor or underground. 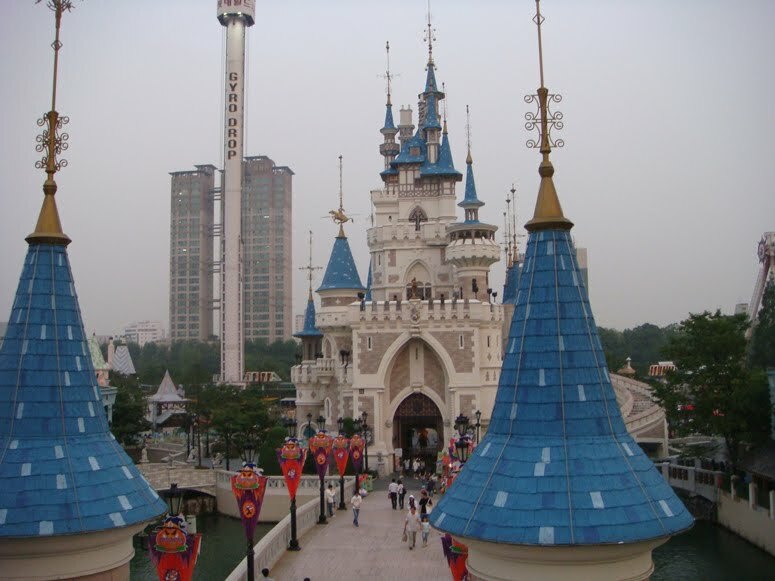 Lotte World has two themes. Inside the building is the ‘Adventure’ theme while outside is the ‘Magic Island’ theme next to Seokchonhosu Lake. The ‘Adventure’ theme has certain areas representing different countries together with many facilities and souvenir shops. You can watch parades, films, laser shows and even savor international cuisine. 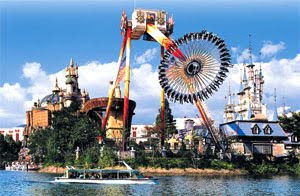 The Magic Island theme consists of the amazing Magic Castle as well as high-altitude rides. There is also a serene trail around the lake for walking. Tourists usually frequent Lotte World for the amusement rides. The most famous are the Gyro Drop and Gyro Swing – which have a steep drop of 70 meters. It is advised to take off your shoes before getting on. Besides that, there is The Flume Ride, which is a long boat with a high-altitude wave. There is also the Spanish Pirate Ship, which swings at 75 degrees. Other than amusement rides, Lotte World’s parades and laser shows are also spectacular. The World Carnival Parade sees 200 performers sing and dance to music. It takes place at 2.00 pm and 7:30 pm. Those keen on watching the laser show can catch it at night at 9:30 pm. For those looking for a good discount, you can go there after 4pm as passports are priced at 28000W instead of the usual price of 35000W. Passports allow you to have free usage of most facilities. Those who just want to stroll around can get the cheaper admission passes at 24000W and 21000W after 4pm. Children tickets are between 16000W to 21000W. 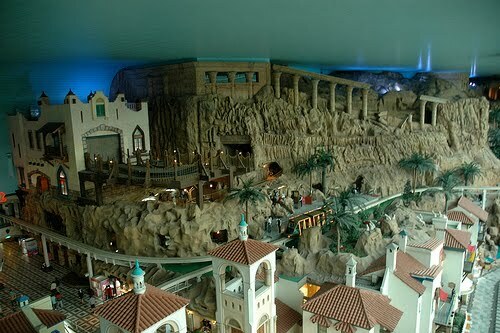 Some reviews we saw about the Lotte World was that food prices inside the park were well within acceptable standards. A food court is located at the Lotte Departmental store where one can eat and watch people ice skating. After that, one can go to the speciality shops and the duty free shopping area located there. However, be prepared for huge crowds as on sunny days there might be one million Koreans coming to Lotte World (as there is not so much else to do for kids in Seoul). In that case you would have to wait over one hour for a ride. Since a picture says a thousand words, you can visually experience a video clip of some of Lotte World rides at the following blog: http://shanewei.blogspot.com/2009/03/lotte-world.html . For first-timers like ourselves, we read that it is recommended to take the monorail located on the second floor first to get our bearings. The monorail spans both indoors and outdoors. For an aerial view of the indoor theme park area, it is recommended to take the “balloon ride” situated on the third floor. Those who are keen on Korean culture or walking through a miniature world can visit the Lotte World Folk Museum which provides an excellent experience of Korea's history and culture through miniature and life-sized representations of everyday and special events. The museum provides diverse cultural programs for children and teenagers, performance events along with special exhibitions and constantly adds new features and special shows to avoid stagnation. The museum has several viewing areas (Historical Exhibition Hall, Miniature Village) and viewer participation areas (Performance Hall, Traditional Korean Market). The traditional wedding plaza also offers visitors the ability to experience a traditional Korean style wedding. During the summer season from July, Lotte World is especially popular because it has an indoor portion for it’s theme park which means shelter from the summer sun.In anticipation of the many attractions there from the rides to the shopping mall, we expect to devote a whole day there at Lotte World. This is also taking into consideration the need to wait for the rides which can result in one queuing between 45minutes to 4 hours for just one ride. 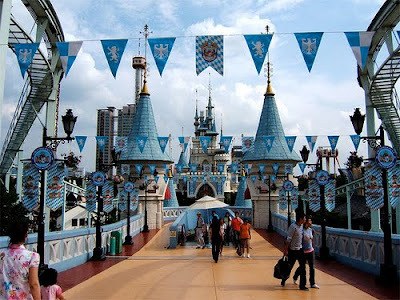 After we have done all we can at Lotte World, we will take the subway from Jamsil Station to Samseong Station where our hotel is and have a good night’s rest for our weary legs.